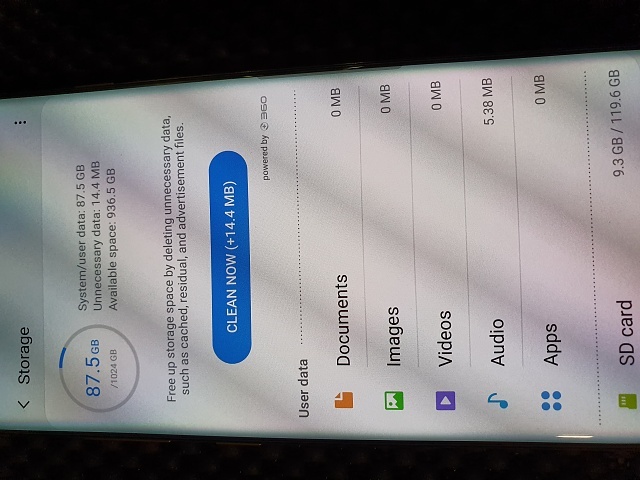 I noticed for the first time just now that my 1TB S10+ reports that 99.5 GB of space is used by other. Apparently the OS doesn't know how to calculate 1TB of space on the phone since it is the first Android phone to have that much space. Hopefully they update this soon. Edited to add the storage analysis screen cap. I must still be asleep. It looks to me like 99.5GB is used by System/User. Storage analysis shows it in other. Mine shows the same thing but the number is 57.7GB. Of course my phone is the 512GB model. Same deal here on my Verizon model. The system on a 128GB model uses like 20 something GB of space while this one uses upwards of 100. The thing is, is I don't remember it reporting the wrong space being used when I first got the phone. I think this started showing incorrectly in one of the two updates we've had since release. This has not changed as it's been this way since day 1. Also,It is not reporting out the wrong storage space. You are using 99.5GB of 1024GB(1TB). That is the all in storage number regardless of what makes it up i.e. system, media, other etc. When you look at the analysis chart, it displays the all in number as a percentage of space being used. In addition to that there is a breakout chart below displaying what makes up the percentage. Notice in the screenshots you provided the 'other' section shows 97GB (not 99.5) because the remaining categories makeup the difference which together come to 99.5GB. Maybe I completely missed your point but I do not see anything that needs to be 'fixed' as I do not see anything that is incorrect. Yeah. It's not like 1TB is totally available anyway, even on a completely empty 1TB drive. I noticed for the first time just now that my 1TB S0+ reports that 99.5 GB of space is used by other. Apparently the OS doesn't know how to calculate 1TB of space on the phone since it is the first Android phone to have that much space. OK, it's still wrong. Even though we know that a 1TB drive is advertised as having 1TB because it sounds better in marketing when in reality, there is really only about 943GB. I've only used 1,5GB of space and the OS takes about 8GB or so so there is still missing space. The OS is saying there is 1024GB when it should be saying there should be about 943, difference between MB and Mb. The OS correctly calculates the SD card as shown in this screen cap below, 1 400 GB card only has 366GB in reality (base 10 calculations) minus the 42 GB of music that I have on the card and it leaves the 324GB or so of available space. It's still not calculating the space correctly on the internal storage. Mine looks like this after formatting the phone. This is not the problem at hand. The system on a 1TB phone uses 80-90GB of space while the exact same system on the 128GB model uses 20-40 GB of space. Something is fishy in China. Hermes Hidayat and radgatt like this. Why the operating shows up at twice the size on the 1TB phone is beyond me and does not seem normal. I think system/user data is for system apps and apps you've installed that's why its different from storage to storage option. This had popped up before. I read about it a while ago. It's been a while so I cannot remember where. But it is supposed to be a percentage of the total storage gets allocated for system stuff. So that's why there's a discrepancy in the numbers and why lower storage devices show lower reserved storage. Hermes Hidayat and Itsa_Me_Mario like this. Thats what i meant. For example if it had 10TB of storage maybe 900GB would be used. areyes163 and Itsa_Me_Mario like this. Exactly....well maybe not exactly but close enough. At least you get my point... And different region has different amount of stuff. I don't know why it's a concern with all that storage. Not trying to be dismissive but I would just rather enjoy what I own than subject it to all that scrutiny.